Louis van Gasteren was born on 20 November 1922 in Amsterdam as the son of the actor Louis van Gasteren and the concert singer Elise Menagé Challa. He grew up in the world of theatre and became fascinated by film. After attending technical school for three years, he went on to study electrical engineering. In the first few years after the Second World War he worked first as a journalist and film critic. At the advice of the film maker Alberto Cavalcanti he decided to enter the world of film through electrical engineering as a sound technician. In the late 1940s, he was an apprentice sound technician at the Epernay Studios in Paris and went on to work for the Polygoon Newsreel in Haarlem. As a member of the Amsterdam Filmliga he organised successful film evenings and a film-music concert in the Concertgebouw in Amsterdam and the Houtrusthallen in The Hague. In 1951, he founded his own production company Spectrum Film. 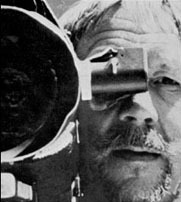 Van Gasteren produced and directed around 80 films. His main subjects are water management, architecture and the survival syndrome. He produced his first film BROWN GOLD in 1952, (directed by Theo van Haren Noman), a documentary about cocoa and chocolate commissioned by the Van Houten company, filmed on location in Ghana and the Netherlands. His most recent film THE GRIEF OF ROERMOND (2005/2006) is about the execution by the Germans of 14 civilians from Roermond on Boxing Day in 1944. Louis van Gasteren has always been involved with art and technology alongside film. This has resulted in several projects and works of art. His fascination for water led to the permanent artworks THE ROOTS OF THE CITY in the Nieuwmarkt Metro Station in Amsterdam, the monument for the AMSTERDAM ORDNANCE DATUM in the City Hall/Music Theatre in Amsterdam and plans for the design of the island Neeltje Jans.